Nena Radusin married Mike Wolfenden in St Mary's Church on 26th January 2017. Expatriates Nena Radusin married Mike Wolfenden in St Mary's Church on 26th January 2017 at 3:00pm. The ceremony was conducted by Carlene Glass-Green, and it was followed by a reception at the Prince Philip Hall. It was a beautiful summers day and the occasion was enjoyed by all. 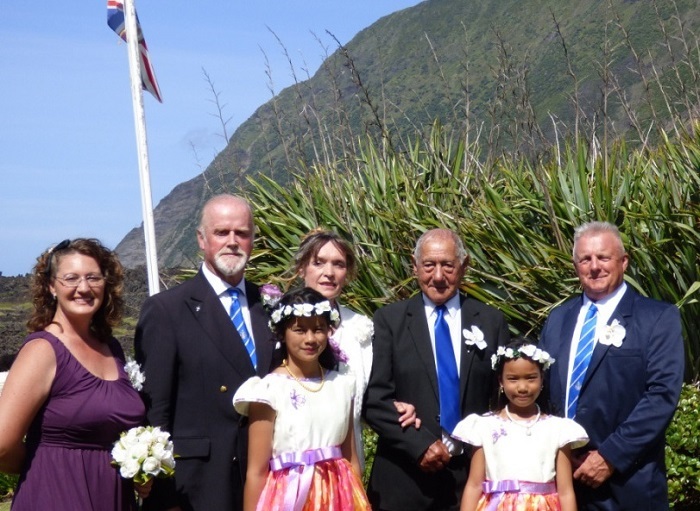 Above left to right: Matron of Honour Sally Wonner, Mike, Roxan Mendoza, Nena, Harold Green who gave the bride away, Sian Davies, and Best Man Barry Davies. Left: Mike and Nena with bridesmaids Roxan and Sian. 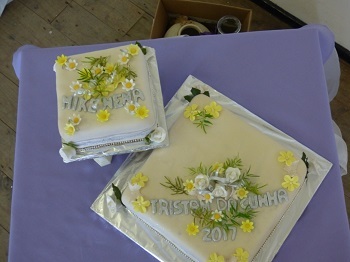 Below left: The wedding Cake. Below right: Nena and Mike at the reception. "It was originally to be on the 8th December 2016, and was moved to the 15 December, but due to the delay in unloading the MV Glory (that took 42 days) due to foul weather. It was again delayed to January 19th a week after the Christmas break. But again on the actual day in the morning there was a terrible fatal accident, so it was moved by tradition seven days further on to the 26th." "Nena and I were overwhelmed with the whole day and the sun shined on us all. Carlene was the first Tristanian woman to take a marriage ceremony, Nena was the first Croatian to be married on the island and the bridesmaids were the first ever Philipino bridesmaids on the island. 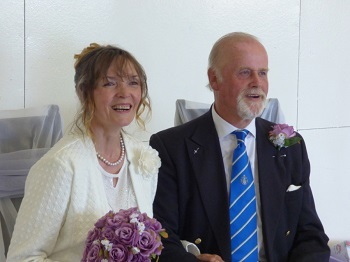 I was the fourth expat to get married, and Barry Davies was the first Welshman to be best man. Nena is from Dalmatia in Croatia and was a Banker in an Austrian bank in Zagreb in the treasury department. We have a house in Dalmatia, a flat in Zagreb and my house in the UK, so we can follow the seasons. I spent the last seven years in Afghanistan so Nena and I have seen little of each other until now. 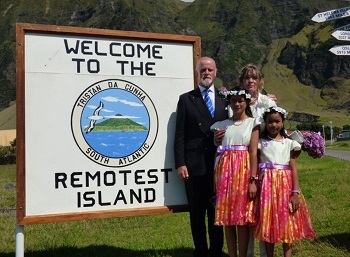 This seemed the perfect place to get married, and we are grateful to the island for allowing us to do so." "We are now going on leave after 16 months and will be back in May 2018."